Eddie Izzard is unbelievable. 8 years of French and 2 years of German in school. And after witnessing people of many nations splashing about peacefully together in Santorini and believing that languages will unite us, he’s decided to do his show in various countries and languages. Standup comedy in foreign tongues, not just in French, which he speaks, but also in German, Italian, Spanish, Russian and Arabic, which he doesn’t. The title of the show, “Force Majeure”, he says, is about his wanting to be a force of nature for peace. He doesn’t believe in waiting for some hand of God to come down and do the business. His brother has translated the show into German, and he began learning it by heart, came to Berlin on 4 January, and on 14 January was on stage, doing the show. The show gets a bit longer every night as he adds new bits he’s learned, and the older parts get a bit shorter as he gets through them more quickly. He handles forgotten lines by interacting with the audience. Finally, a suitable context for that word! It slows his pace down, but also provides the opportunity for some fresh improvisation, playing with words and the audience. Then he surfs on the positive energy of the audience. The basement at the Imperial Club seats no more than 150, and maybe 100 people were there on Sunday, so it’s all rather intimate. I was close enough to get a good look at his lovely manicured fingernails, with the Union Jack and the flag of the EU painted on them. The show is set to continue through to the end of February. Tickets and dates here. He says sometimes he can access language at will, it all flows out of him, and sometimes he’s completely stumped. In the interview below he somewhat surprisingly says he doesn’t think there are any cultural differences in humor. His jokes work in any language, he says. I’d agree, but isn’t that simply a measure of Britain’s lead in the world of comedy? With Britain’s history, after all, how can it not be multi- and cross-cultural? I’ve found an illegal recording of the show from about a week ago. Judging from what I heard as compared to what the video shows, he’s already made some headway. In the Cornelsen coursebook I’m writing, and in my classes, I warn my students against turning their presentations into straight pitches. Robert McKee, the Hollywood scriptwriter, has pointed out that the audience doesn’t really engage with and is not convinced by a presentation that tries to sell only strong points. People aren’t dumb. They’ll instinctively know that the presenter is giving them only half of the story. Instead, McGee says, presenters should use the typical shape of stories for their talks, and take their audience through all of the highs and lows. According to McKee, all stories follow a basic pattern: “Essentially, a story expresses how and why life changes. It begins with a situation in which life is relatively in balance.” But then an event occurs that introduces a complication. The plot thickens as the protagonist tries to restore balance, working with whatever means are available and taking action in the face of risks. Now, that may be true for the basic pattern, but there are clearly variations. 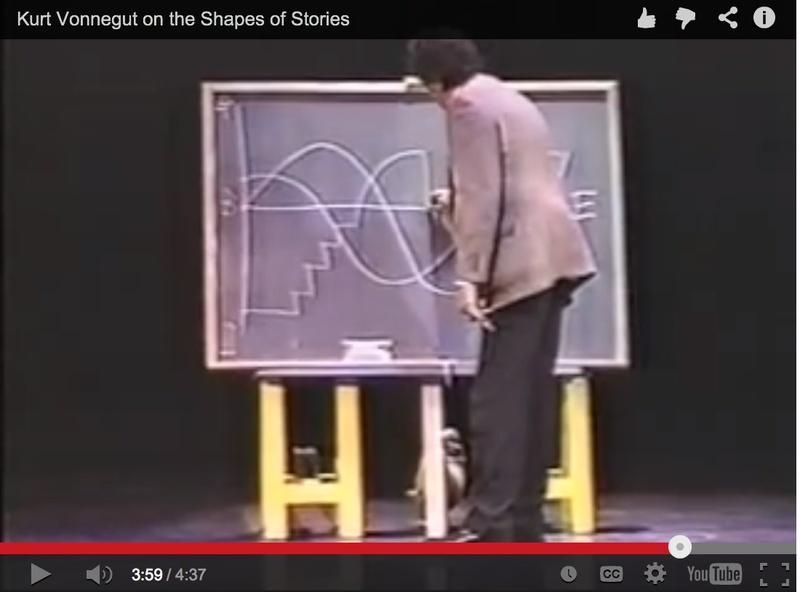 In this lecture, novelist Kurt Vonnegut (Slaughterhouse Five, Breakfast of Champions, God Bless You Mr Rosewater) presents three such variations along a line from B for Beginning to E for… Electricity. A seminal, very useful book is turning 50 this coming year. Published in 1964, and the best selling non-fiction book of the 1960s, Games People Play by Dr. Eric Berne introduced Transactional Analysis, which looked closely at human relationships. He opted to study interaction as transaction, since he said we communicate to get something out of it. For example, if one person says hello, and the other person doesn’t respond, the first person feels cheated or irritated, since he or she expected to get something out of saying hello. Berne said we communicate in three ego states, as the parent, the child and the adult. Everybody has these three people inside their head, which explains the mental cacophony we sometimes experience. When we are emotional, we are the child. Supportive or exerting power over others, we are the parent. Acting rationally, and focusing on the objective problems at hand, we are the adult. And the obvious way to go is to be the adult. This still comes across as fresh to me. It’s good, solid, everyday advice, the very basis of Emotional Intelligence, i.e. applying reason to how we engage in social situations with others. The games we play, he says, like “If it weren’t for you”, are all rackets. Anger is one of those rackets, he says. It makes you feel righteous for a while, but doesn’t solve anything. Instead he says we have to decide to look at what is making us angry and think about why the other person is doing it. That means not letting the other person win the game by allowing ourselves to get angry. It’s an interesting and engaging challenge, and one that can actually improve the situation. Among the aspects Berne identified as worthy of therapy are scripts that he said we develop and follow early in life, and can for instance recognize in fairy tales. Below is a wonderful 1966 NET Science broadcast special on the book. The reporter interviews Dr. Berne at his home in Carmel where the author explains the theory behind Transactional Analysis. The camera then follows the two of them along the gorgeous Carmel coast – where incidentally Helmut and I spent almost a week last summer. And finally we see Dr. Berne in with other California psychologists, Swinging Sixties style. Watch these four short videos for an exquisite introduction to the theory, and take an evocative journey into the epoch when Transactional Analysis was still new. Eric Berne passed away in 1970. A website dedicated to him contains selected games he identified. See if any of them ring a bell with you. They did with me. ‘Uproar’, with slamming doors, is a game I used to play a lot with my dad when I was a trouble-making teen. And I find it quite sobering to recognize that I still like to indulge the Child in me. On this note: I want a sun umbrella just like Dr. Bearne’s. Yoda: A Jedi craves not these things. No. Try not. Do… or do not. There is no try. Ready, are you? What know you of ready? For eight hundred years have I trained Jedi. My own counsel will I keep on who is to be trained! A Jedi must have the deepest commitment, the most serious mind. This one a long time have I watched. Never his mind on where he was. Hmm? What he was doing. Hmph. Yes, a Jedi’s strength flows from the Force. Anger, fear, aggression; the dark side of the Force are they. Easily they flow, quick to join you in a fight. consume you it will, as it did Obi-Wan’s apprentice. You will know when you are calm, at peace. Passive. When you look at the dark side, careful you must be. For the dark side looks back. Size matters not. Look at me. Judge me by my size, do you? Hmm? Hmm. And well you should not. You must feel the Force around you; here, between you, me, the tree, the rock, everywhere, yes. Even between the land and the ship. When 900 years old you reach, look as good, you will not. Posted on November 25, 2013 December 9, 2013 Categories short filmTags film, language, short filmLeave a comment on Yoda: A Jedi craves not these things. English for Artists should highlight different art forms, e.g. profiling artists expressing themselves in the various media. The Thrash Lab vlog and YouTube playlist include a profile of Saber, a graffiti artist who has branched out. In this profile he describes the work that made him a name, similarities to typography, and how he reacts to young people today who engage in the illegal art of graffiti. I knew that art was what I wanted, and graffiti was the venue that I chose. It just so happened to be the biggest piece in the world – the biggest illegal piece ever painted. Videos on painting from life by The Art Students’ League of New York would be useful in an English course for Artists. Here I would focus on how an artist, Sharon Sprung, describes her process as she paints. Notice how difficult it is to multitask, producing both visually and verbally, and both commenting on the process and beginning a new action, This involves associative holistic and analytical faculties at the same time, and makes the artist sound slightly distracted. On the receptive side, as you watch, you’re filling in what the artist shows but doesn’t explicitly say – or can’t express in words – which adds a completely different dimension of understanding. In these videos I find it’s almost impossible to listen without watching, or to watch without listening, to understand what is going on at any given moment. Explore The Art Students’ League of New York YouTube channel.